gradient (GB) Your browser does not support any audio element. inclinaison, pente (F) Your browser does not support any audio element. pendenza (I) Your browser does not support any audio element. Height difference between two points in relation to their horizontal distance in percent. The angle is calculated with: arcus tangens x (height difference broken by distance). An upward slope is called slope, a downward slope (the two terms are only linguistically different, mathematically there is no difference). At 30% slope, the other 100 meters (horizontally) distant point is 30 meters higher, giving an angle of 16.69 °. An inclination of 75% gives 36.87 °. A slope at 100% corresponds to an angle of 45 °, ie 100 meters horizontally and 100 meters vertically. Up to this tendency is in viticulture the employment of Monorackbahnen A monorail of 200% corresponds to an angle of ~ 64 °. For inclination angles just below 90 °, the slope grows to infinity. A slope of 90 ° corresponds to a vertical wall. More than 90 ° correspond to overhanging walls. When expressed in percent (%), the angle of inclination and the slope are not proportional to each other. It is therefore not possible to convert angles and slopes with a final calculation (mathematical method to calculate the unknown fourth value from three given values ​​of a ratio). The steepness of vineyards is usually stated in percent. 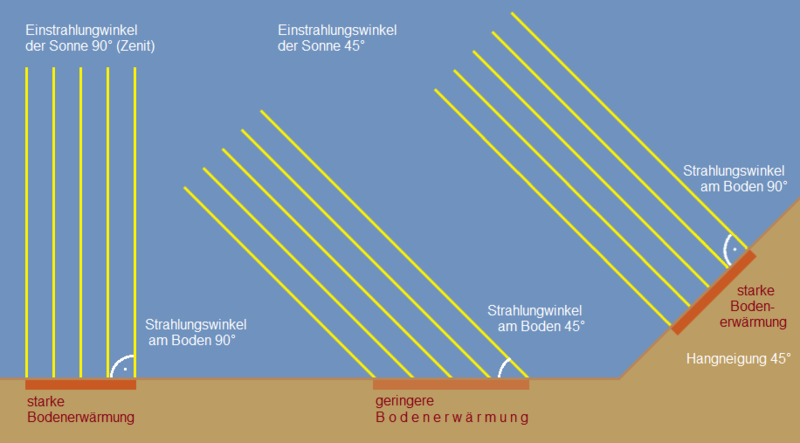 However, it is not uncommon for the given values ​​to be incorrect due to incorrect conversion (for very steep vineyards, the slope is often over 45 ° or 100%). Steep vineyards are favored by good (at best vertically incident) sunlight and usually provide better grape or wine qualities. In addition to the angle of inclination is also the exposition (Direction of sunshine) of importance. Important criterion for the Weinbauwürdigkeit from vineyards is a hillside with good inclination. This page was last modified at 3 May 2018 at 13:06.